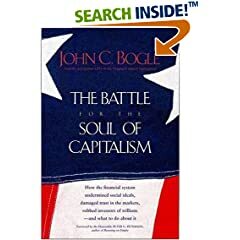 The Battle for the Soul of Capitalism is an interesting book. Well, judging by the first chapter anyway. It purports to tell us corporate excess of the kind that contributed to the recent stock market collapse of the last few years. It goes to the root of what capitalism is about, namely owners putting their capital on the line to make investments and reap the rewards. Today we have something else, where the people in charge are the corporate managers, and the ownership is so diffuse nobody knows who owns what. yet at the same time the percentage of total wealth owned by the top 1% has gone from 15% in 1970 to 40% today. Coupled with this is a shift from business as a practice of high integrity, to one where people regularly stab each other in the back and agreements last only so long as they are useful. Integrity isn't just moral, he says, but it also promotes a strong business climate as it is easier to do business with someone in whom you have trust. The author of the book is not some outsider looking in. He was the founder and former chief executive of the Vanguard Group, and has been an advocate of individual investors for a long time.